Pizza. The Italian classic has crossed over into just about every cuisine. Including Thai. You've probably heard of 'Thai Chicken Pizza' from specialty pizza shops. 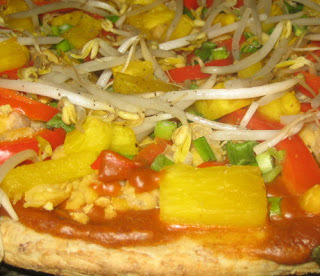 I take this pizza down the vegan path with Thai Chick-Un Pizza from ED&BV. I simplify my life by using a prepared whole-wheat pizza crust. But, if you want to make your own crust - by all means go for it! Then, the peanut sauce is slathered on the crust. Before baking, some toppings are added. 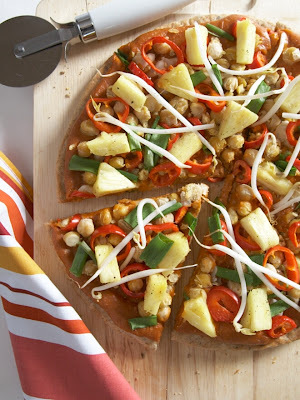 First, lightly squished (or you can keep them whole) chickpeas, slices of crisp red pepper and juicy cubed pineapple. Of course, if you'd like to use faux chicken strips in place of the chickpeas, you can do so. For me, I enjoy keeping this pizza truly 'Chick-un', so chickpeas are my choice. Sliced green onions are added for the last minute or so, and then after baking, the bean sprouts are sprinkled over top, along with the optional cilantro and/or peanuts. That's it! Not too difficult, right? I've wanted to post about this pizza for a loooong time. 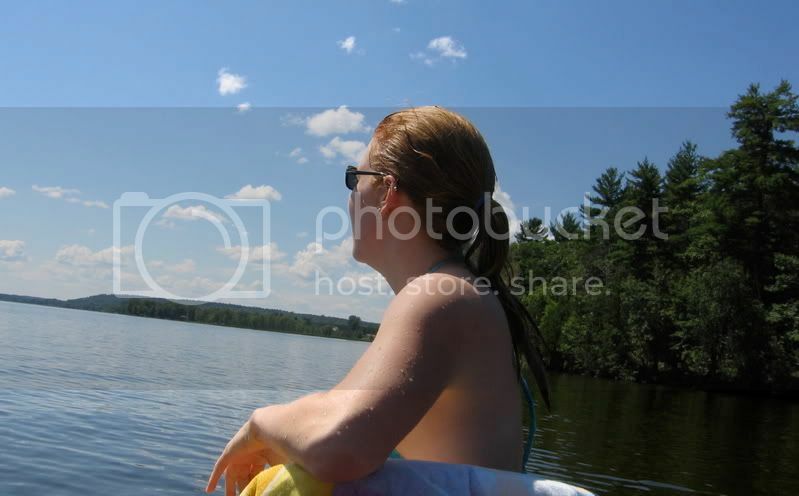 As you can see, though my picture wasn't *quite* as pretty. Just as lip-smackin' tasty... just not as good-lookin'! Knowing we'd be photographing this recipe for the cookbook, I held back. But, it was hard to - I've been anxious to share details on this pizza because this is one of my fave recipes from the book. Some of you may finally be getting your copies of ED&BV, so try out this pizza asap! Right away when I was looking at the pictures in ED&BV, my eyes stopped at this pizza. I don't know how you held out on us- it is beautiful! I'm thinking about making this on a tortilla- using your method in VLV. And I'm with you on the chickpeas over the fake chicken! Thanks Dreena for another awesome recipe- you're the best! The pizza was actually the first recipe that jumped out at me as sounding amazing! I'm holding off, though-for a girl's night, since Matt doesn't like peanut sauce...I can't wait to curl up to a good movie and eat me some Thai Chik-Un Pizza! The pizza looks and sounds delicious. Hip Hip Horray! E,D,&beV finally came in the mail today! I just don't know what to make first. Maybe the chocolate pumpkin pie I have been hearing everyone rave about? Thanks, Dreena for another wonderful cookbook. You make me so excited to get in the kitchen and prepare wonderful healthy meals for my family. On another note, I just found out that I do not have gestational diabietes with this pregnancy. This is amazong b/c I had it with both of my other kids. I know that my better diet is what did it and you are one of the main reasons I was able to keep it up! With such great tasting food, why eat junk? Mmmm.. it makes my mouth water! !I'm a pizza-addicted and i can't wait to try this pineapple goodness( but i must, till i receive my copy of ED&BV. It's so hard waiting..).Yesterday i made your choco-cinna-nut biscuits and chickpea ratatouille: our dinner was a great hit! !Thank you so much!! You're the best!! I LOVE the new cookbook - truly your best yet! I can't wait to try this pizza, and the chocolate pumpkin pie, and the black bean and orange hummus...and everything in between! Hey Dreena, I just made this tonight for supper, it was absolutely outstanding, LOVE the peanut sauce. Sadly, I was out of chickpeas, oh well, there's always next time. Veggiegirl, you'll be busy cooking/baking once it does arrive - your family will be well fed anyhow! Teresa, the photo *is* quite pretty, huh? I was so pleased with that photo when we did it. Thanks! Veggie vixen, I have to agree... those ARE two of the funkiest food sensitivities. Makes you all the more special! mom2wilmo, that is VERY interesting about your gestational diabetes. I have to believe that credit can be given to your healthier diet as well... give yourself a pat on the back, my dear... that's just AWESOME! peace, love... I just saw that recipe too - looks quite different, but it's funny that there are similar thoughts about recipes out there! just tried this last night. Was fantastic!Any ideas about the leftover sauce? I have never enjoyed thai check pizza However it could be nice & tasty.